The first month of the Trump presidency was punctuated by a series of anti-immigrant executive orders and implementation memos that resulted in chaos at airports around the world, immigration raids around the country, and a widespread fear among communities.1 The Trump administration’s actions and directives ostensibly target the 11 million unauthorized immigrants who live in the United States, but they will also harm millions of American citizens all across the country who live and work beside these immigrants every day.2 A new analysis by University of Southern California’s Center for the Study of Immigrant Integration, or CSII, and the Center for American Progress shows that millions of people, citizens or otherwise, live in mixed-status families with at least one unauthorized family member in the same household. Undeniably, there is no way to separate immigrants out from the U.S.-born population; there can be no us versus them. Nationwide, about 16.7 million people in the country have at least one unauthorized family member living with them in the same household. 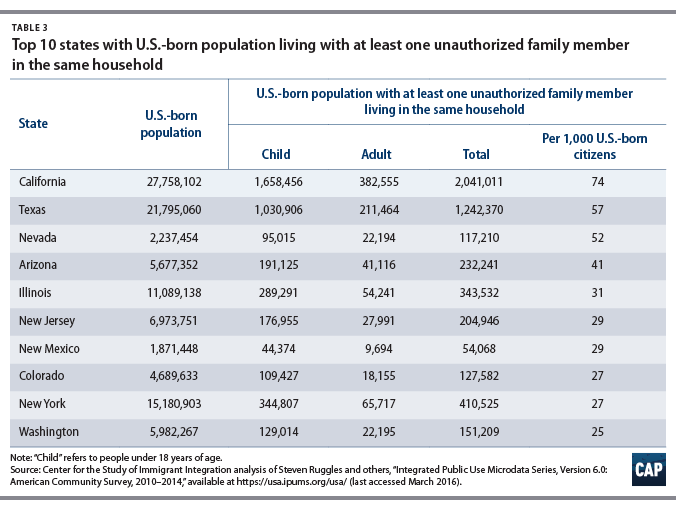 More than 8 million U.S. citizens, of which 1.2 million are naturalized citizens, have at least one unauthorized family member living with them. 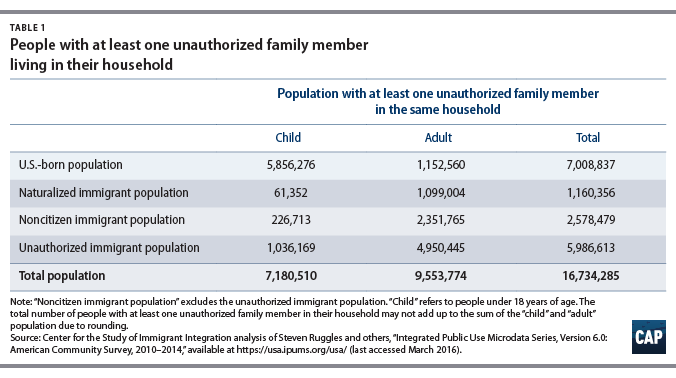 More than 5.9 million citizen children, U.S. born and naturalized, live with at least one family member who is unauthorized. California, Texas, and Nevada, are the top three states that will be most heavily affected by an anti-immigrant policy because they have the highest percent of U.S.-born population with at least one unauthorized family member living with them. But even states with smaller immigrant populations, such as Nebraska, Arkansas, and Kansas, will also be affected, because they have high percentages of naturalized citizens who have unauthorized family members living in the same household. 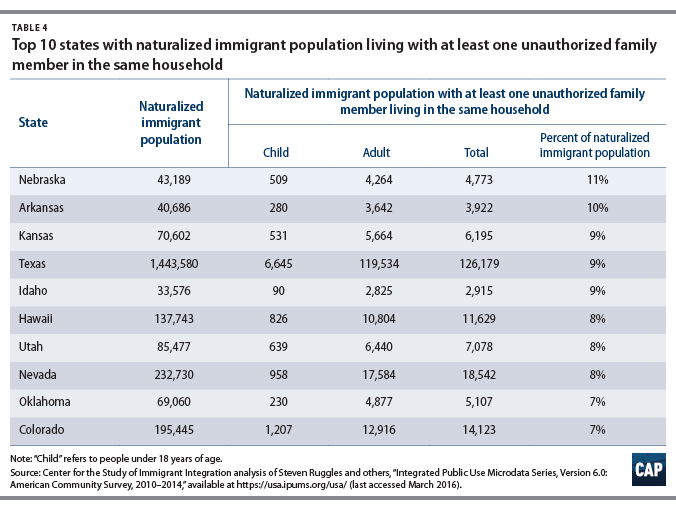 For this brief, CSII analyzed the 2010-2014 American Community Survey to estimate the number of family members of unauthorized immigrants based on the methodology from a 2015 CAP report.3 These estimates are by their nature conservative since they do not include an accounting of the number of family members who do not live in the same household. 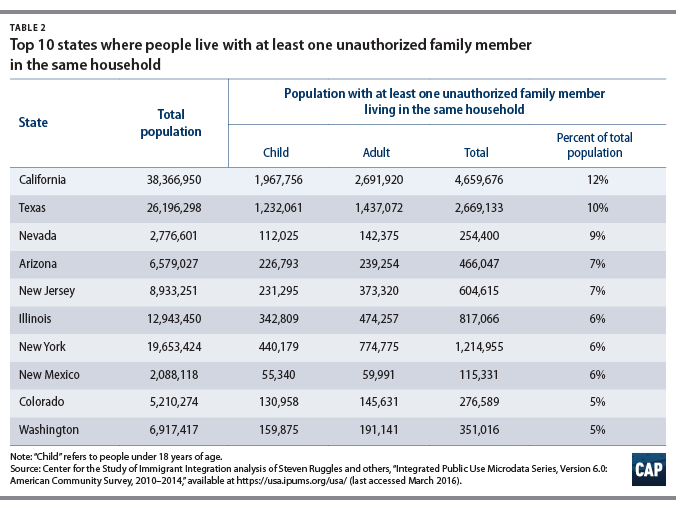 CSII’s analysis shows that 16.7 million people in the country have at least one unauthorized family member living with them in the same household. Moreover, a high share of these individuals—nearly 8.2 million people—are citizens or naturalized citizens. 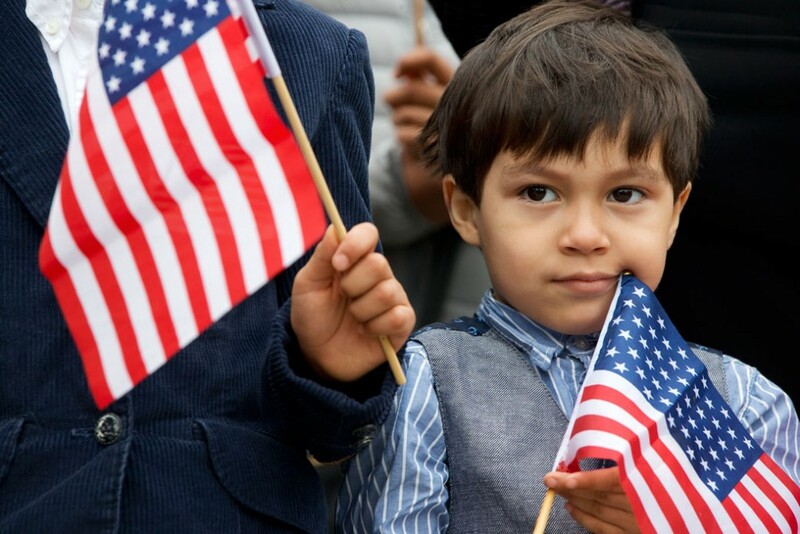 Of these U.S.-born and naturalized citizens who live with at least one unauthorized family member, 72 percent are children. Therefore, when a policy of enforcement and mass deportation targets the estimated 11 million unauthorized immigrants living in the United States, it also threatens the well-being of millions of citizens and their families, and erodes their trust in their community and the government. In California, nearly 4.7 million people—12 percent of the state’s total population—live with an unauthorized family member. Among them, around 2 million, or 42 percent, are children younger than 18 years old. Child’s share of unauthorized family members is even higher—more than or close to 50 percent—in states like Wyoming, South Dakota, and Arizona. New York and New Jersey also have large immigrant populations and a high number of people who have an unauthorized family member living with them.4 Other less populated states, including Colorado, Nevada, and New Mexico, have a substantial percentage of people living with an unauthorized immigrant family member. Looking at just the U.S.-born population, California still tops the list with more than 2 million U.S.-born citizens who live with at least one unauthorized family member. Similarly, 57 out of 1,000 U.S.-born persons in Texas and 52 out of 1,000 U.S.-born persons in Nevada live with an unauthorized family member in their household. As mentioned earlier, many of these U.S. citizens are children; the scope of the impact of anti-immigrant policies and actions therefore goes far beyond just the unauthorized immigrants it targets. For example, among the U.S. born people living with at least one unauthorized family member, 91 percent—or about 169,700 out of 187,000 people—are children in North Carolina, the highest among all states. This percentage is similarly high in other states such as Delaware, Wyoming, Nebraska and Tennessee. The group of states whose naturalized citizens will be most affected are quite different. States such as Nebraska, Arkansas, and Kansas, which are generally not considered immigrant-heavy states, top the list of states with the highest percentages of naturalized citizens who live with at least one unauthorized family member in the same household. The different spread of states in this analysis shows that the effect of an anti-immigration policy is not just limited to bigger states, such as California and New York. Rather, the effect is more expansive and will also affect smaller states that may not have a high immigrant population. Recent immigration raids have resulted in arrests of more than 600 immigrants in one week from across at least 11 states, from California to Indiana and Georgia to New York.5 This wide net has swept up people from all walks of life. A mother of two citizen children, Guadalupe García de Rayos, who had reported to the U.S. Immigration and Customs Enforcement, or ICE, every year since she was swept up in a raid by the notorious former Maricopa County, Arizona, Sheriff Joe Arpaio, was deported to Mexico and separated from her children.6 There are reports of people being arrested in their homes, outside schools, and outside churches.7 These are the real world consequences of the mass deportation plan currently being rolled out. The threat of deportation alone is enough to break apart communities and cause high levels of stress in families. Research shows that immigrants who fear deportation avoid public spaces and interaction with police officers.11 In areas that see more immigration enforcement, unauthorized immigrants are fearful of driving, accessing much-needed health care, or even doing something as mundane as walking down the street. This erosion of trust makes the entire community vulnerable because people are fearful of reporting crimes, coming out as witnesses, or reporting domestic violence abuses. A focus on keeping families together—rather than a relentless focus on ramping up enforcement—would be a better, pragmatic solution to the issues facing immigration policy in the United States. Silva Mathema is a Senior Policy Analyst for the Immigration team at the Center for American Progress. The author would like to thank Manuel Pastor, Justin Scoggins, and Alejandro Sanchez-Lopez at the University of Southern California’s Center for the Study of Immigrant Integration for providing the analysis for this brief.